A job notice has been given for NHM recruitment by the National Health Mission. The most qualified and effective competitors will have to submit their application for the 261 posts of accountants, nurses, laboratory technicians, supervisors and drivers before the last date of January 31, 2019. Eligibility details: 10th / 12th / undergraduate degree (Dental Surgeon / Social Work / Sociology / Psychology) / Diploma (Dental Hygienist / Mechanist) / MBBS / DCA / DMLT / MD Microbiology / Ph.D. Medical Microbiology / M. SC should have passed. . (Medical or Applied Microbiology) / MBA (Fin) / B.Sc. Nursing with good academic records from a well recognized institution / board. Candidate should be between 18 to 45 years (post 1-4, 626), 18 to 60 years (post 5), 10-01-2019. Monthly remuneration: Those applicants who will be successfully recruited against NHM, they will get Rs. Will get the salary of 26,250 / - (post 1), Rs. 8710 / - (post 2,3,8), Rs. 25,000 / - (post 4), Rs. 40,000 / - (post 5,11), Rs. 10,910 / - (post 6), Rs. 9091 / - (post 7), Rs. 15,000 / - (post 9,10), Rs. 31,818 / - (post 12), Rs. 11,500 / - (post 13), Rs. 11,000 / - (post 14,17,25), Rs. 13,500 / - (post 15), Rs. 15,000 / - (post 16), Rs. 10,000 / - (post 18-21), Rs. 14,000 / - (post 22), Rs. 12,500 / - (post 23), Rs. 19,000 / - (post 24), Rs. 6200 / - (post 26) from the recruitment of the organization. First of all, candidates will have to go to the organization's web portal, which is http://www.nrhmhp.gov.in. This will open a list of latest opening links and candidates will have to select the most appropriate link, which will open the full ad with more details about NHM vacancies. Deadline for submitting online application is: 31-01-2019. 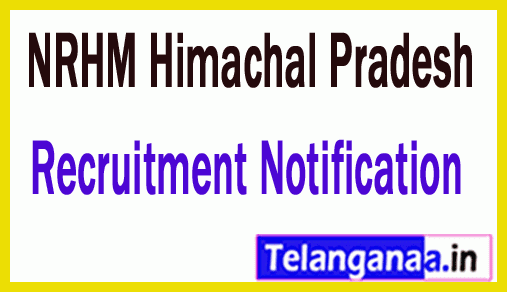 National Health Mission, Himachal Pradesh (NRHMHP) invites application for the post of 05 Medical Officer & Pediatrician. Apply before 20 February 2017. Medical Officer - MBBS Degree recognized by MCI. Must be registered with the HP State Medical Council. Pediatrician - MBBS with PG Degree in pediatrics recognized by MCI. Must be registered with the HP State Medical Council. Selection Process - Selection process will be based on Short listed and interview. Application Fee - Candidates have to Pay Rs.200/- through demand draft in Favour of Mission Director, National Health Mission payable at Kasumpti, Shimla -171009. How to Apply - Interested Candidates may apply in prescribed application form along with self-attested copy of all relevant documents, experience certificate & Self addressed two envelope size 6”x 11” duly stamped with Rs 5/- send to Mission Director, National Health Mission SDA Complex Shimla-171009 on or before 20.02.2017.